Have you ever taken a moment to think about how your vehicle's tires are made? Probably not, yet doing so may help you better understand what goes into our tire repair service. More than just a few inches of thick rubber, your tires are actually made from layer after layer of fabric cords called plies. These plies sit atop steel belts that help to reinforce both the sidewall and the treads, which is formed from several layers of synthetic rubber. Steel cable loops called beads give the tire the strength needed to stay seated on the rim. Once those components are placed together, they are run through a curing machine which cuts the tread pattern and bonds all the components together. 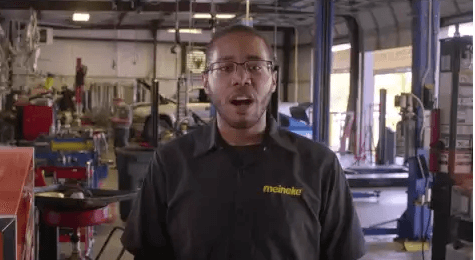 To learn more about tires, including tire repair cost, visit Meineke #4047 in Riverside, CA today. The question of "why are tires so important?" typically comes up when the need for a tire repair shop arises. It is a question that deserves some thought. Nearly every aspect of your vehicle's performance, including braking, acceleration, steering, traction, and handling, are all largely dependent on tire performance. Issues with the tread, balance, or stability of your tires and wheels could affect your control of your vehicle in an emergency situation. Thus, if you suspect any problems, you should visit Meineke #4047 in Riverside, CA for repair or tire change service right away. If you have older or damaged tires, you may be wondering about potential warning signs. Fortunately for drivers, many of these signs are easily observable to the naked eye. If you notice that your tires are punctured or cracked, it may be time to consider taking your vehicle to a tire change service provider. If your pressure sensor constantly gives low readings, even after you fill your tires with air or change them, your car may need to undergo tire pressure sensor replacement. Many of these issues are signs of severe damage, so call our Riverside, CA, Meineke #4047 location if you notice any of them. Have you ever noticed how well your vehicle's different component systems work together? Unfortunately, they tend to deteriorate together, as well. You'd be amazed at how trying to avoid a simple tire repair cost can result in extensive damage to your vehicle. That's because unbalanced tires lead to increased wear on certain wheels as they try to support extra weight. Not only does this speed up their wear, but it also can affect your vehicle's suspension as it tries to compensate for this imbalance. Rather than allowing this to happen, research your "tire repair near me" options to find Meineke #4047 in Riverside, CA. More than likely, if your tires have not been replaced in over ten years, they will need to be replaced. If you have had your current set of tires for more than five years, professionals recommend having them inspected at least once a year just to be on the safe side. In general, how often you need to replace or inspect your tires will depend on your mileage, driving habits and the road conditions your most frequently encounter. If you constantly drive long distances at high speeds, please remember to schedule an inspection at your local store in Riverside CA Meineke #4047. Because tires are your vehicle's only direct contact with the road, they should always be kept in the best possible condition. 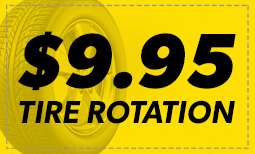 Tire rotation cost is a small price to pay to ensure that your vehicle is safe. Moreover, you can actually increase your fuel mileage by keeping your tires well repaired and maintained. Save money in the long run by taking your car or truck to Meineke #4047 in Riverside, CA for inspection, maintenance and repairs. We offer competitive pricing and tire rotation coupons to help you experience the best savings possible without compromising safety.